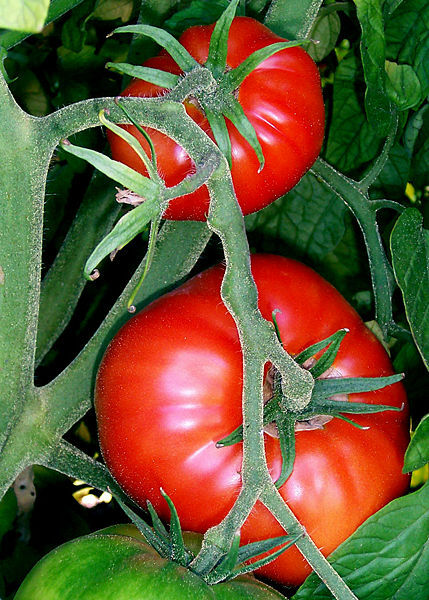 Now that summer is winding down, tomatoes are at their best. I am grateful to my friend who has shared her homegrown tomatoes with me! Here is a recipe for tomato salad, with a couple of variations, to take advantage of them at their juiciest and ripest. The salad will have the best flavor if you use a mix of different kinds–heirloom tomatoes preferred, and include yellow ones, striped ones, and cherry or grape tomatoes. This recipe was inspired by Jamie Oliver’s “Mothership Tomato Salad,” but I changed it a bit. His calls for dried oregano, which I’m not crazy about, and a fresh red chile. I use fresh basil instead, and no chile. Feel free to experiment! The cucumber is optional. I’ve made it with and without; both versions have their virtues. Enjoy the end of summer…..
Slice up the tomatoes, some in chunks, some in quarters, and some in half if they are small like cherry tomatoes. Put them in a colander and season with a good pinch of sea salt. Give them a toss, season again with sea salt, and toss again. The salt won’t be drawn into the tomatoes, so don’t worry that the salad will be too salty! Let the tomatoes sit in the colander for 15 minutes and throw away any juice that drains out. Transfer the tomatoes to a large bowl. If you’re adding a cucumber, cut it in thin slices or small chunks and toss in with the tomatoes. Cut up the basil into strips (kitchen scissors are good for this) and add to the bowl. Toss all this a bit. Make a vinaigrette of 1 part vinegar to 2 parts oil and the garlic. Add the dressing and toss lightly to coat the salad. Add fresh ground black pepper to taste. This would be terrific with some mozzarella or some rustic bread. Some of my friends have jetted off to exotic places, and others are staying home and picnicking at outdoor concerts, going to dance performances and generally enjoying summer stay-cations. I have been remembering vacations in my childhood. We couldn’t afford to fly anywhere, much less to stay in a motel (remember motels? ), so our vacations were either day trips or long drives to visit more distant relatives. One trip we made many times was from our home in Tennessee through Kentucky to Ohio, to visit my oldest sister and her young family. This was in the early days of the interstate highway system, and Kentucky was pretty low on the priority list for completion. I think we went KY 68 much of the way, and finally got to the Bluegrass Parkway, a toll road. The route was mostly two-lane blacktop highways with the occasional passing lane. The roads wound around the hills and hollows, passing through towns like Horse Cave and near Mammoth Cave National Park. I was in the back seat, trying not to get carsick as our un-airconditioned car swerved around the curves. Daddy liked to drive fast, and Mother was constantly front-seat-driving from the passenger side. “George! You’re making me nervous!” was her frequent cry. My favorite part of the trip was stopping at Stuckey’s. Any Southern or Midwestern road warriors will remember them. Often they were the only place to get snacks and gasoline on these highways winding from one one-horse town to another. Their claim to fame was the famous Pecan Log Roll. Stuckey’s also sold the driest, nastiest pralines on the face of the earth, but we thought they were great since we’d never had the real thing. It was a tremendous treat to stop there, look at all the tourist junk, and maybe get a candy bar or a piece of pecan divinity. I coveted the small figurines of horses made of ceramic or plastic–I was into collecting horses and reading horse stories at that time. They also sold novelty goods like cups that spilled on you, and I think I remember comic books. 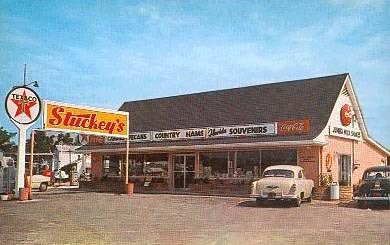 We’d get Cokes to go with Mother’s box lunches (another big treat, since Cokes were forbidden at home), park in the shade, and gas up and hit the restrooms before getting back on the road again. A road trip, indeed! I went over to hang out, pet them and help socialize them. There was an article in the New York Times science section several years ago which explained the types of cat personalities and said studies had shown cats are more socialized toward humans if you handle them when they are small kittens, less than 8 weeks old. So playing with and petting kittens is actually good pet parenting. It’s a great excuse, anyway! Spending an hour with them reminded me how much fun they are–and how much work! I’ve always adopted adult cats because they have a harder time getting adopted, and because they already have their personalities and habits. These three little kittens were tiny furballs in perpetual motion, then they would just conk out. The largest was a grey male with white paws, whose fur stuck out in all directions. The middle one was a pretty female, sort of tabby. 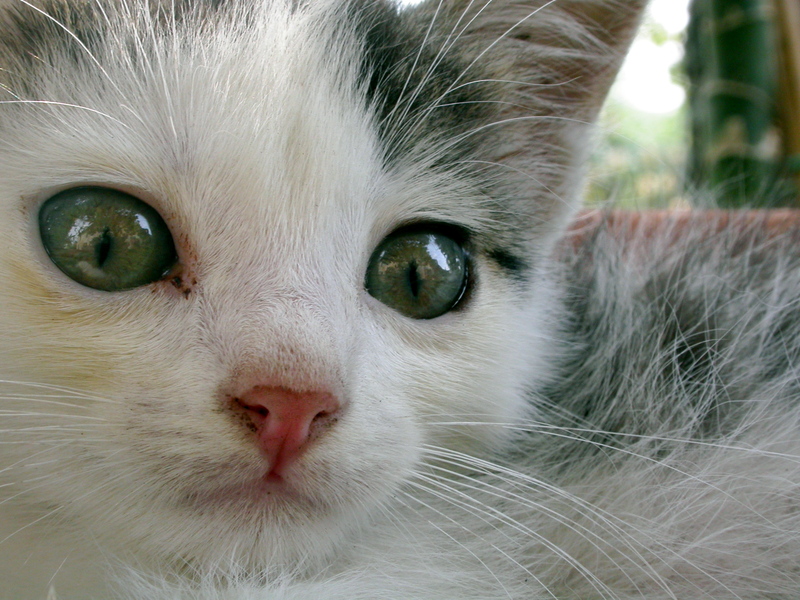 The runt of the litter was a tiny female with muddy markings and a white stomach but a loud squeak of a meow and a purr bigger than anything a creature that small should be able to produce. She discovered she could climb up the front of the couch before I rescued her from an end table. Kittens are like wild children, running until they are exhausted–wild children with claws, who can climb curtains and shred chairs! I was tempted by the runt, but I’m afraid my aggressive cat would not react well to a small, furry irritant. Playing with them and petting them was good for them, but it was great for me. It’s impossible to think of anything unpleasant when a little fur lump has its head tucked under your chin, purring. I’ll come play again before they find homes, I hope.